Imagine for a moment you are elderly and live alone or maybe in an aged care home. It’s the middle of the night when you get up for a drink of water and on your way back to bed you fall. Scared and alone, lying on the floor, you call for help which may or may not arrive quickly. Eventually help arrives and you are taken by ambulance to your nearest hospital for assessment and treatment. You are told you are staying the night, but you have nothing with you, no toothbrush, deodorant or something sweet for comfort. As you wonder what to do, a nurse comes in with a Smiles 2U Essentials pack. It has everything you need. Just enough to put your mind at rest and provide some comfort during the night. Recently we were given the opportunity to place a full page add in OffSpring Magazine. This magazine has a huge readership with over 100,000 copies to families in Sydney. The magazine is aimed at families with children from 0 - 12yrs old. The aim of our add is to encourage more Australians to get involved in supporting Smiles2U and donating to us. As you travel through parenthood, you might become more familiar with a local hospital’s Emergency Department than you’d like. And, more often than not, when an accident or an emergency happens, you will turn up totally unprepared! But one special North Shore Mum and her team are working hard to make sure that visit to the hospital isn’t a scary one for your kids. The screening of A Bad Moms Christmas is to support the incredible local community group, North Shore Mums Smiles2U, who create thoughtful care packages for children and parents who unexpectedly find themselves in the emergency department of a local hospital. North Shore Mums Smiles2U aims to make this worrying time just a little bit easier by providing entertainment for the kids and little luxuries for the parents. Tickets for the night are just $30, and include the screening, a goody bag and lucky door prizes! And even better, 100% of profits are going to Smiles2U, so they can continue to support their five local hospitals and all the local families who use them. Recently we added WISE Emergency Clinic to our list of hospitals that we support. Thank you to Michelle Key from Smiles2U for the goodie bags! Please take the time to read all about Smiles2U and how it is assisting mothers and children in the community. 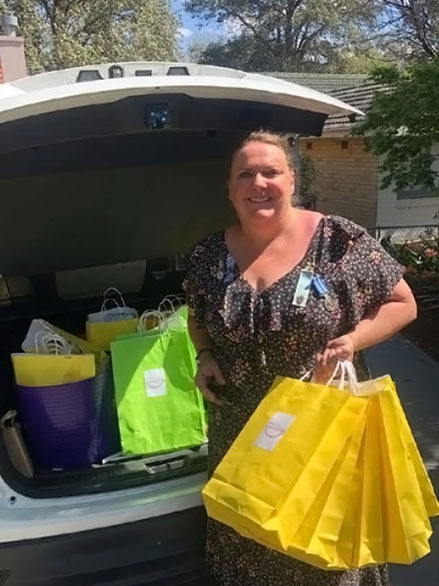 Recently Living Local Guide approached Smiles2U and wanted to feature us as their Guest Blogger, they had heard about our Mother's Day drive at the local hospitals and wanted to do a story on us. North Shore Mums Smiles2U was very honoured to be nominated to receive a grant of $500 from Lindfield Community Bank as part of their program in supporting and investing in local community projects. We were presented the cheque at a Cheese and Wine evening at the Bank in November 2015. This grant will be put towards the production of the bags for both hospitals. Turramurra and Lindfield Community Bank - Branches of Bendigo Bank have been providing a full banking service in the Ku-ring-gai area since October 2003. However, our Community Banks provide much more than just banking services. As a local owned company, we are committed to returning our profits back to our local community. we pay dividends to our local shareholders and make contributions in the form of grants, donations and sponsorships to numerous organisations, including charitable, sporting and educational bodies. To date we have been able to give more than $1.48 million back to the Ku-ring-gai community. The more people that bank with us, the more funds we will have available to share with our local community. The Paediatric Unit at Hornsby Hospital's 'Treasure Chest' of toys was in desperate need of a boost. When a child requires a procedure on the ward, is having surgery or having a Birthday in hospital, the child is offered to choose a toy from the chest. The Chest was running low and The Smiles Team thought that our members would love to get involved. Well the response from the public was overwhelming and Smiles2U and our members managed to fill the Toy Chest to overflowing with brand new toys!